God or demon!? The strongest man appeared in Hell 4 октября 1984 г. The Zankei death blow!! Lights appeared at the end!! 11 октября 1984 г.
Punches are burning on a dark street! Five fingered explosive burst!! 18 октября 1984 г. Attack bloody cross!! The secret punch by soft strikes 25 октября 1984 г. The flame of love in Hell. You're already dead!! 3 ноября 1984 г. The evil's plan. Attacking the man with 4 scars! 15 ноября 1984 г.
Villains! Countdown to death 22 ноября 1984 г.
Rip into the nerve cells! No requiem for the bad guys 29 ноября 1984 г. Criminals! Pray before you die!! 6 декабря 1984 г.
Flame death blow! Too many people should die!! 13 декабря 1984 г. Villains!! Listen to the requiem from Hell!! 20 декабря 1984 г.
I am the God of Death!! I'll chase you to the ends of Hell!! 10 января 1985 г. The arhat deva fist! The endless killing!! 17 января 1985 г. These grieving times! Many kind people die too early!! 24 января 1985 г.
I count to three! You are the one who is dead!! 31 января 1985 г. Try to sing, villains! The counting rhyme of Hell!! 7 февраля 1985 г. Fight if you are a man! The guts of confrontation have opened! 14 февраля 1985 г. Life or death!? At the end of the wilderness lies the first street of Hell!! 21 февраля 1985 г. Damn! Get ready to die!! 28 февраля 1985 г.
Nightmarish full-scale war! My fists pack one million volts!! 7 марта 1985 г. The palace is on fire! Shin! I'm close to finding you!! 14 марта 1985 г.
Julia forever...as well as Shin! 21 марта 1985 г. Battle is all that awaits me! 28 марта 1985 г.
Nanto suichoken! The tragedy of the strong begins!! 4 апреля 1985 г. The evil people! Their name is the Fang Clan!! 11 апреля 1985 г.
Tremble while you sleep! The bandits of Night Fog Valley!! 18 апреля 1985 г. Only criminals can laugh! I hate this age!! 25 апреля 1985 г.
Rei! I'll wipe your tears with my fists!! 2 мая 1985 г. It's too late for begging! Death to the Bandit King!! 9 мая 1985 г. Fate is unavoidable! Who is Jagi!! 30 мая 1985 г. Mask of Hell! He who terrorizes in the name of the North Star!! 6 июня 1985 г. The four linked fists of rage! Jagi, Hell is waiting for you!! 13 июня 1985 г. This is a miracle village! The fallen angel! 27 июня 1985 г.
Toki! You are an angel or devil!! 4 июля 1985 г. Evil man! Toki, you have gone bad!! 11 июля 1985 г.
I don't have the past to use! Just my hatred for Toki!! 18 июля 1985 г. Refuse your love! Because he is the death star...! 25 июля 1985 г.
Ranzan punch! An unfortunate woman!! 1 августа 1985 г. The evil legend! The door to Casandra!! 8 августа 1985 г. Evil doesn't need graves! This is Hell's Casandra!! 15 августа 1985 г. 2000 years of grief! Ken's footsteps!! 22 августа 1985 г. End of the century with no tomorrow! This is the day waiting for Ken!! 5 сентября 1985 г.
Casandra is destroyed! The legend of the Hokuto won't change!! 12 сентября 1985 г. The death star shines! Ken, are you bidding with another's life!! 19 сентября 1985 г. People are afraid of death! Lynn's cry of rage!! 26 сентября 1985 г. Calling From Hell! Rei, Did You See the Death Star!! 10 октября 1985 г. The Nanto Suicho-Ken Dance of Death! I'll Give My Life for the Sake of Love!! 17 октября 1985 г. Final Moves Explode! The Fate of Hokuto Brothers Exceed Hatred!! 24 октября 1985 г. The Strongest Battle in History! Raoh vs Ken! You're The One Who Will Die!! 31 октября 1985 г. Death Sentence in 72 hours! The Death Start Drags Rei!! 7 ноября 1985 г. Fate Without A Future! She still Believes in Love!! 14 ноября 1985 г.
Yuda of Nanto Roku Sei Ken! I Am More Beautiful Than Anyone!! 21 ноября 1988 г. Death Omen Star is Falling!! Rei! Heaven Trics Time Cruelly! 28 ноября 1985 г.
Dear Mamiya! The Death Omen Star is Hiding in the Sparkling of your Eyes!! 5 декабря 1985 г. You Will Die, Rei! The most beautiful of men!! 12 декабря 1985 г. Beautiful Fighters Rei vs Yuda! Tears are Unnecessary on a Man's Path!! 19 декабря 1985 г.
Farewell Rei! The Legend of the Hero Will be Passed Down Through the Generations 26 декабря 1985 г. Military Rule in Troubled Times. When Nanto Falls Into Disorder, Hokuto Appears 9 января 1986 г. The Dark Star Is Covering the Heavens! It`ll Move After the Deadly Battles 16 января 1986 г.
Shuu of the Nanto Hakurou-Ken! What are You Watching at the End of this Century 23 января 1986 г. Love on the Battlefield! Will this Era Tear Love Apart? 30 января 1986 г.
I`m The Holy Emperor, Souther! Both Love and Compassion are Forbidden 6 февраля 1986 г. The Young Warrior Challenging Fate! The Cry of his Soul Moves the Heavens 13 февраля 1986 г.
Bloody Battle: Shuu vs Souther! Love is Drowned by the Tears of the Star of Benevolenc 20 февраля 1986 г. The Bloody Holy Cross Pyramid! Shuu! My Heart Will Hold Your Tears 27 февраля 1986 г. Run, Kenshiro! Another Friend is Going to Die!! 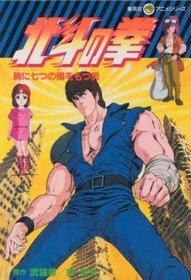 6 марта 1986 г.
Kyoku-Sei Showdown, Ken vs Souther! Only My Star Can Protect the Heavens!! 13 марта 1986 г.
Souther, the Sad Holy Emperor! Love Wears You Down!! 20 марта 1986 г. The Strongest Era of Hokuto! The Fate of the 3 Brothers Finally Begins!! 27 марта 1986 г. Another Hokuto Shin Ken! Cast Raoh Into Darkness!! 3 апреля 1986 г. The Birth Secret Revealed! Heaven Desire`s Tragedy!! 10 апреля 1986 г.
Farewell Toki! The Tear`s Fall Only Once!! 17 апреля 1986 г. Man of the Wolf Star, Ryuuga! I Will Take Hold of that Rainbow!! 8 мая 1986 г. The Wolf Running Towards the Horizon! The End of Love and Hatred!! 15 мая 1986 г.
Forgive Me, Sister! Fighting Hokuto is the Fate of My Star!! 29 мая 1986 г.
Fist of Fire Versus the Howling Wolf! Now Toki is in Danger!! 5 июня 1986 г. The New Age Awakens! The Wolf`s Howl Reaches the Heavens!! 12 июня 1986 г.
Nanto Sei Ken`s Shin! You Live and Die for Love Getting Nothing in Return!! 26 июня 1986 г.
Rei, of the Nanto Suicho Ken! There is a Man Who Died For His Friend!! 10 июля 1986 г.
Yuda, the Nanto Koukaku Ken! Your Beautiful Smile Caused Tragedy!! 17 июля 1986 г.
Shuu of Nanto Hakurou Ken! The Heavens Have Dealt You a Cold-Hearted Fate!! 24 июля 1986 г.
Holy Emperor Souther! You Love More Than Others Because You`re Obsessed With It!! 31 июля 1986 г. Prepare For Death, Raoh! Legend Will Turn Into Fear!! 7 августа 1986 г.
Nanto`s Strike Back! Wind Army, Protect the Last General!! 14 августа 1986 г.
Prelude of the Deadly Battle!! The Cry of Hyuui, the Man of the Wind, Echoes to the Heave 21 августа 1986 г. Burn, The Red Army! The Tears of Flames Ignite Shuren!! 28 августа 1986 г. The Goshasei In Danger! Raoh Finally Breaks Through The Flame!! 4 сентября 1986 г. The Goshasei Approaches Kenshiro! Fudo, Who Are You!! 11 сентября 1986 г. The Wind and Cloud Revelation! Ken, Fate Awaits At The Capital of Nanto!! 25 сентября 1986 г.
I am Juuza, the Cloud! I Leave My Destiny to the Flow of Time!! 16 октября 1986 г. The Cloud Has Yet To Move! The Last Nanto Star Finally Revealed!! 23 октября 1986 г.
Juuza Revived! I Do Not Fear Raoh!! 30 октября 1986 г.
Showdown: Juuza vs Raoh! The End of the Invincible Legend!! 6 ноября 1986 г.
Fudo is in Danger! Hurry Ken, A Man Never Deserts His Friend!! 13 ноября 1986 г.
Merciless Inferno of Sand! Is There Any Help for Dying Fudo!! 20 ноября 1986 г. The Fall of Juuza! I`ll Protect the Woman I Love With My Life!! 27 ноября 1986 г.
Farewell, Yuria! Even When Facing Death, A Warrior Will Not Speak Of Love!! 4 декабря 1986 г.
Disturbance in the Nanto Capital! The Two Hokuto Brothers Meet At Last!! 11 декабря 1986 г.
Sorrowful Goshasei! You`re the Woman Burdened by Love and Fate!! 18 декабря 1986 г. The Ultimate Secret, Musou Tensei! Raoh, You`ve Finally Been Cornered!! 25 декабря 1986 г. Will Raoh`s Ambitions Perish with his Fall? The Heavens are Still in Disarray!! 8 января 1987 г. The Mighty Raoh is Lost in Confusion! I Will Not Believe in Love!! 15 января 1987 г. The Demon`s Challenge! Fudo, Become a Demon for the Sake of Your Loved Ones!! 22 января 1987 г. The Gentle and Brave Fudo! Those Tears Awaken A Burning Passion!! 29 января 1987 г. Guard the Nanto Jibo-Sei! Even at the Cost of the Lives of the Gosha!! 5 февраля 1987 г.
Raoh, Frightned by a Nightmare! Yuria, You Are the Reason!! 12 февраля 1987 г. The Decisive Battlefield is the Hokuto Renkitouza! No One Can Stop Them!! 19 февраля 1987 г.
Farewell, the Two Hokuto Brothers!Your Love And Sadness End Now!! 26 февраля 1987 г. A Look Back! The 2000 Year History of Hokuto!! 5 марта 1987 г.